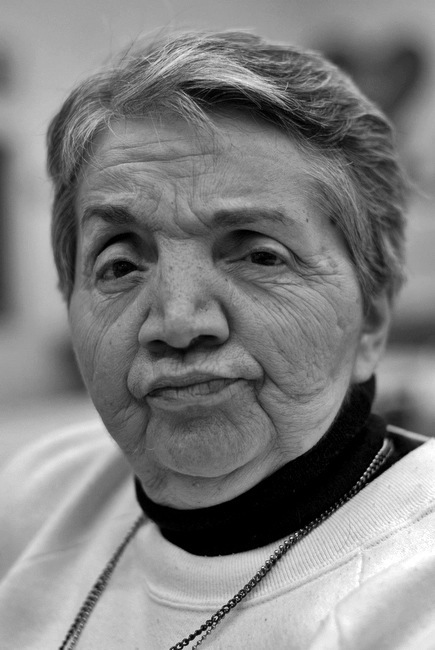 This is the first in a South Brooklyn Post series featuring portraits and interviews with longtime residents of South Brooklyn–Carroll Gardens, Cobble Hill, Boerum Hill, Red Hook and Gowanus. Our bustling corner of Brooklyn isn’t south geographically compared to Coney Island. But for about a century we were known as South Brooklyn. Here are our stories. 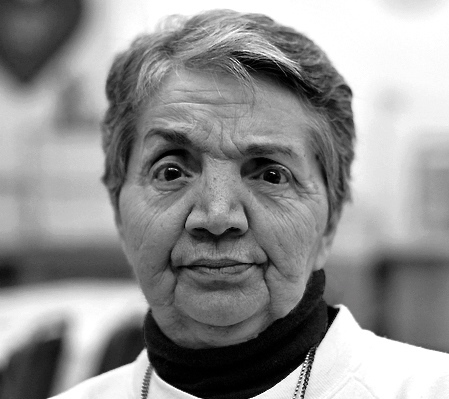 Cacace, 74, is known as “the mayor” among older, mostly Italian-American residents who hang out at the Eileen Dugan Senior Center, on Court Street, across from Carroll Park. The seniors, many of whom live month-to-month on social security checks, congregate at the center every day for $2 lunches and games of Bingo and cards. 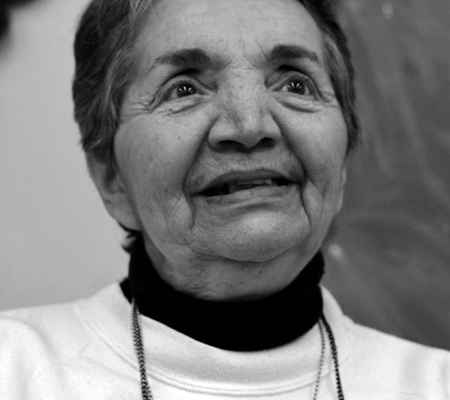 I hung out with Cacace recently at the senior center as she ate lunch: pasta with meat sauce. Like many at the senior center when I visit, Cacace is a big fan of the name, South Brooklyn Post. She’s got a beef with “Carroll Gardens,” a name coined in the late 1960s by Buddy Scotto, a community leader and owner of Scotto’s Funeral Home, along with other leaders who were trying to renovate the neighborhood and bring investment and renovation here. Back then, brownstones sold for $25,000. Growing up, nobody wanted to come to South Brooklyn, because people were afraid of the Italians and Puerto Ricans who lived here, Cacace says. She leans back and forms her hand like a gun. “Because we’re all mafia, with gold teeth. You scared of me?” she asks. “Sometimes I have to mess with people, and say, ‘Hey, that’s my brother, you scared of him? When neighborhood leaders started pushing the names Carroll Gardens, Cobble Hill and Boerum Hill, some at that time said they wanted to improve the neighborhood. That was painfully insulting to locals, Cacace said. Newcomers would tell the old-timers not to sit on stoops. “You are insulting my mother, my family. We made this neighborhood the way it is. And now you want to come in and change it. “If I went to Osh Kosh, Missouri, and went in like Loretta Young, with beautiful clothes and a big chiffon dress (Cacace twirls around to demonstrate), you don’t have the class she had under her shoes,” she says. “If I went to Osh Kosh, and everyone was wearing a beehive, do you think I would laugh at their hair? “You don’t have to be rich to be proper,” Cacace says. A recent Harris poll showing that people think New Yorkers are rude has Cacace’s blood boiling. Cacace’s friend, who didn’t want to be quoted, but is also in her 70s and lives on Sackett Street, says she also has felt looked-down-upon by newcomers. Cacace married in 1960. She says the neighborhood started changing after that. She reminisced about the old days. She grew up in a small apartment, with two beds for 11 people. She remembers it so fondly she drew it out on a piece of paper for me to see. Kids would sleep on the fire escapes in the summers back then, and go to the “Tar Beach,” on the roofs, to get sun. Cacace’s mom delivered her ninth baby when she was 51 years old. “She was a strong lady, ahead of her time,” Cacace says. Back then, banks wouldn’t give loans to Italians, Cacace says. In the 1950s, Cacace’s family had to move to “the hook,” when Robert Moses tore a path through Carroll Gardens with the Brooklyn-Queens Expressway. The BQE path went right through Cacace’s apartment house. There’s been continual movement since then. It’s hard for many of the older residents who stayed, as they’ve seen families disburse, often because rents and the cost of living is too high, or because homeowners cashed in (and out) on skyrocketing property values. Cacace’s two sons live out West, and have often asked her to move. She won’t. “I’m not ready,” she says. The staff at the center urges everyone out. Lunch is over. As we exit, she looks at me. “Not all the newcomers are bad. I’ve met some nice ones,” she says. I ask if she likes any of the changes to Carroll Gardens since all the newcomers started flooding in. Crime has fallen more than 100 percent since then, for instance, and the elementary schools are better than money can buy. She looks off, to the side. Stares into the distance. “Hmmmm,” she says. She crinkles her brow. She seems to be honestly contemplating the question. “Wait five minutes. I have to think on that. I have to separate from the pompissity… ” Cacace says. “I’m sure I’ll think of something. Hipsters & young professionals swarm to pockets of affordable urban locations and colonize neighborhoods as their own in a “New-New York” minute. Unlike the traditional migrations of the past that created the character of the neighborhood by establishing an identity through generations of families, the new residents don’t have to assimilate to the community they inhabit-they essentially force the neighborhood to assimilate to them. The supply and demand economic model that actually creates the identity of a neighborhood is refabricated with a more expensive, homogenized version of the same thing. Unique cultural by-products like food, social clubs, holiday traditions, and the unwritten rules of the neighborhood are outbid and outranked by new people with new money. What was never perfect, yet a cohesive community in the purest form of the word has become a location of transition for twenty-somethings that yearn for a lifestyle more interesting than where they grew up. The new residents are temporary however. They don’t really plant roots in the community. The gentrified enclave is not “home.” They will not likely settle down and procreate here. When that time comes they will move into a neighborhood that more suits there needs. They will also eventually get priced out. As the migration to the “hot” neighborhood increases so does the affordability. What’s left is a hyper inflated cost of living and the opposite of a community. A dream for the Corcoran’s of the world, but a nightmare for middle class residents that paid their dues through the tough times and now have to leave because the influx of new wealth have made it impossible to exist here. You laughed at the guy that said the rent was “too damn high,” but he was absolutely right. People can certainly make the argument that the new transformations make the quality of life better for residents and provides options that were previously unavailable. The reality however, is that those new resources mostly benefit the new inhabitants with means. You should also note that gentrification doesn’t stop crime. Gentrification happens AFTER crime stops. I’m not against innovative dining experiences or new business ideas, or the inevitable evolution of human existence. I am against the obliteration of the “neighborhood.” I’m against affordable housing being eviscerated by aggressive development geared toward luxury living. I’m againt the blatant abuse of eminent domain laws and the swallowing up of public space by private firms. I’n against hotels going up by the dozen, while kids in public schools compete for space in trailers that sit in schoolyards that they used to play in. I have had the misfortune of dealing with Ms. Cacace on several occasions. She is indeed combative, presumptuous, accusational, and seems deeply unhappy (the photo above is the only time I’ve ever seen her crack a smile). To accuse (almost) everyone who’s moved to the neighborhood over the past 40 years of not respecting her when she refuses to extend a kind word or to see new neighbors as anything but interlopers is a ridiculous double standard. And here’s the rub: she snipes at all of these newcomers, many of whom are highly active in community organizations, yet her civic participation begins and ends with vociferously complaining about any and everything that isn’t done exactly as she sees fit. To refer to her as the mayor of anything is ludicrous. Fortunately, the vast majority of neighborhood old timers are far more friendly, open, and welcoming. A community’s character is communal, whether someone has lived there a day or a lifetime. What a coincidence that the neighborhood started changing in 1960 when she was only 22 years old. Or has it always been changing and she only just noticed when she reached adulthood? I’m sure the older generation in 1960 was commiserating about how Brooklyn’s never been the same since 1920.